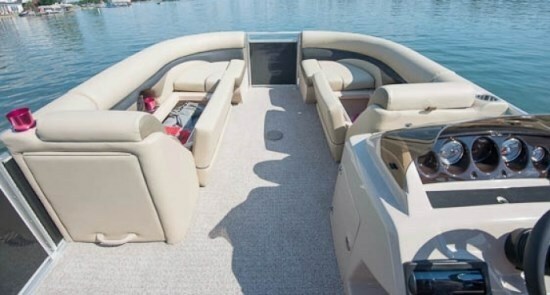 Harris FloteBote of Fort Wayne, Indiana, with over fifty-five years in business, offers nineteen models of pontoon boats in 2013 from eighteen to twenty-seven feet in six series with over forty-eight floorplans from which to choose. 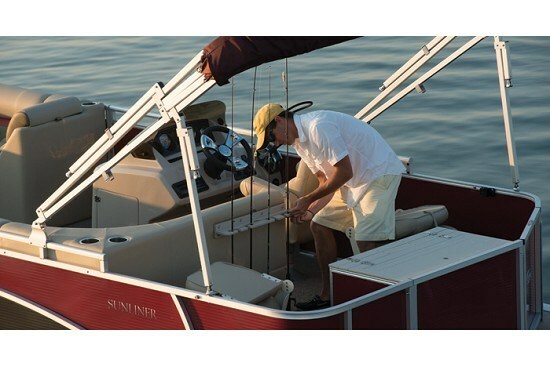 The Sunliner 200 subject of this review is one of three Sunliner models from twenty to twenty-four feet with a total of five different floorplans. Let’s explore these three Sunliner 200 floorplans, the 200 Cruise, the 200 FC (Fish and Cruise), and the FS (Fishing) further. All three offer a substantial aft swim deck behind the rear fence for water access and watersports or fishing. 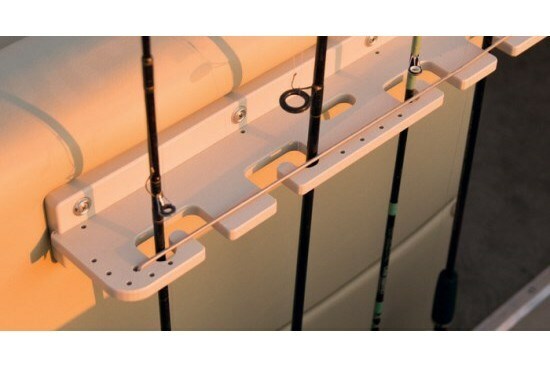 A starboard side 5-step folding swim ladder off this deck is standard on all three. A total of four boarding gates are also provided – one each side plus bow and stern. The starboard side helm located roughly midship is also identical on all three layouts. This “auto-inspired” helm comes standard with basic analog gauges for tachometer, fuel, volts, trim, and hourmeter, a custom tilt steering wheel, binnacle-mount motor controls, a removable tinted windscreen, plus an internal storage compartment. The helm-mounted standard stereo is a Sony Silver AM/FM/CD/MP3. This may be upgraded to a Sony Platinum BT/USB unit. The basic helm seat is a lowback, non-recliner and may be upgraded to Lux (lowback recliner) or to Ultra Lux (highback recliner) with or without a flip-up bolster and/or a height adjustable base. 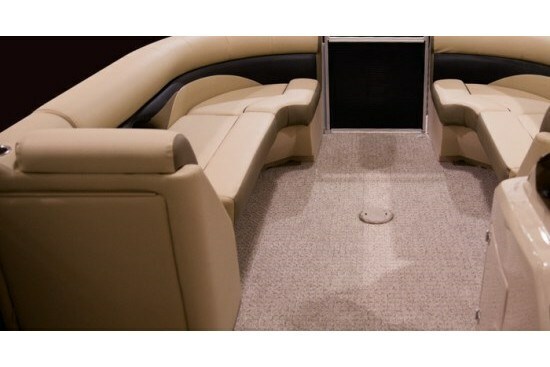 Aft seating on the Sunliner 200 Cruise layout consists of a large L-shaped portside lounge with storage below and an oval table. Both the 200 FC and the FS layouts give you a curved 2-3-seater lounge opposite the helm plus two aft fishing seats and an aft fish station. Up front on the 200 Cruise and the 200 FC are facing three-seater lounges which may be filled in right at the bow with cushions to create a full U-shaped surrounding lounge. The 200 FS provides port and starboard single bench seats ahead of the helm with a another pair of fishing seats ahead of these benches bringing the total of fishing seats on this layout to four. On all three layouts, a number of features are standard including a large, ten-foot bimini top, a changing room with curtain, “Regal” carpet, and TPO vinyl flooring on the aft swim deck. 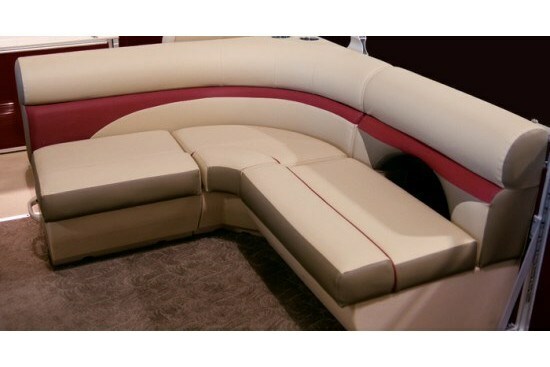 You can choose from a total of six colour options and five accent colour options. What will take you perhaps the most time and will require the most thought in outfitting your Sunliner is the phenomenal number of available options from which to choose. 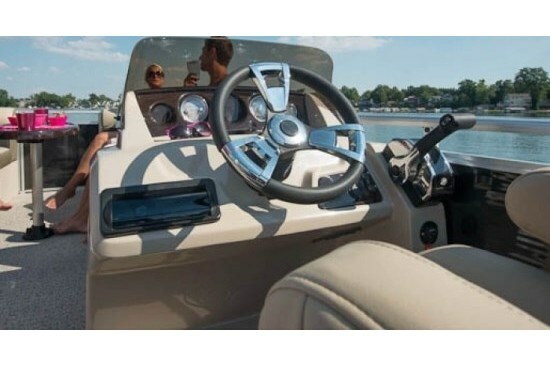 Single outboard power from either Mercury or Honda is available from 25 to 150 horsepower with hydraulic steering being required for the highest horsepower listed. 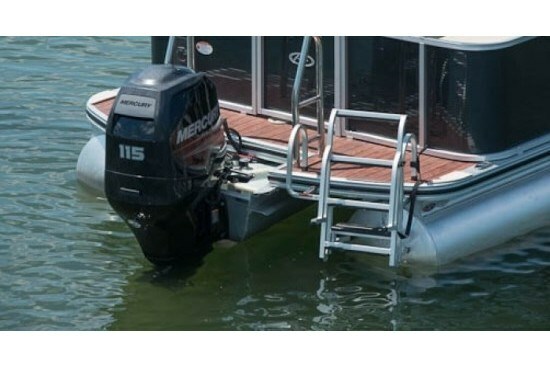 You can also choose a Mercury 9.9 or a Torqeedo electric outboard for “kicker” motors. A “Rough Water” package and two “Salt Water” packages are available as are “Convenience” and “Lighting” packages. Three choices of ski tow bars, four cupholder style options, and four battery charger/switching options are all available. A larger bimini top and a full mooring cover are available as is an air compressor, 25-qt. cooler, 2-foot bow extension, and stainless steel grill. LED under-deck docking lights are standard but you may want to add courtesy lighting, bimini and ladder lighting, rope lighting on the seat bases, underwater lighting, rubrail lighting, lighted speaker and even lighted cupholders. You can add a sink with faucet and freshwater, a porta potti, many flooring and carpet options, a stern sunpad, gauge upgrades, and specific fishing conveniences such as a livewell, fishfinder, and depthfinder.